John’s family does Thanksgiving up big… his mom has 8 siblings that all convene at grandmother’s house, each with a dish in hand. We flew down for the holiday, but I still wanted to bring something to the feast, so I had to get creative and find a recipe to fit the circumstances. All of the basics were covered: turkey, stuffing, gravy, cranberry sauce, potatoes, yams, green beans, salad, rolls and lots of pie pie pie (I counted 14 desserts). And, I would be cooking in someone else’s kitchen, which poses its own set of challenges: unfamiliarity, different tools and equipment, and the need to purchase many ingredients. After much internet research and feedback from friends and family, I decided to go with a carrot cake. It did not fit the seasonal theme I was going for, but it is a Jessee family favorite. And besides, how can you go wrong with homemade cream cheese frosting!!! 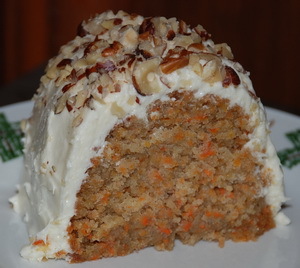 Carrot cake is actually pretty easy to make. Besides grating those carrots, it is pretty much like making a muffin. The most important trick is to not over beat the batter. As a result, you will have a light, fluffy, moist cake. I made this one in a bundt pan, but you could also use a regular cake pan, as long as it is deep enough or split it into 2 pans and reduce the cooking time. If you make a layer cake, you probably will want to increase the frosting to have enough to fill the middle. I got this recipe from my trusted source, Alton Brown, and adjusted the spices slightly. I chose hazelnuts to top the cake with because John is allergic to walnuts and pecans. Plus, hazelnuts sounded like something different and interesting to try with cake. I liked them, but you could substitute just about any nuts that you prefer. Grease and flour a 9 inch round, 3 inch deep cake pan or a bundt pan, set aside. Peel and grate or food process the carrots, set aside. Whisk the flour, baking powder, baking soda, spices, and salt until well combined. Add the carrots to the flour mixture and stir until the carrots are well coated with flour, set aside. Whisk the eggs in a small bowl. Add the yogurt, then the sugar and brown sugar and continue whisking until just combined. Slowly drizzle in the oil, whisking constantly. Pour the liquid mixture into the dry mixture and stir until just mixed. Pour the batter into the pan and bake for 35 minutes. Reduce the heat to 325 degrees and bake for another 10-20 minutes or until a toothpick inserted in the center of the cake comes out clean or the cake reaches 205-210 degrees in the center. Remove from oven and cool for 15 minutes in the pan. Turn the cake out on a cooling rack and let cool completely. Beat the butter andcream cheese in a stand mixer with the paddle attachment or a hand held mixer until blended. Add the vanilla and beat until combined. Add the powdered sugar in 4 additions and beat until smooth between each addition. Refrigerate the frosting for up to 10 minutes before using. Chop the hazelnuts, set aside. Frost the cooled cake and sprinkle the hazelnuts on top. This entry was posted on Friday, December 5th, 2008 at 10:31 pm	and is filed under Cakes. You can follow any responses to this entry through the RSS 2.0 feed. You can leave a response, or trackback from your own site. I was thankful that she honored my family with her cake. It was delicious! 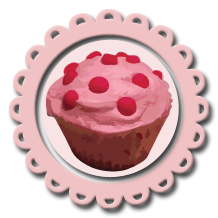 Kricket Cakes is powered by WordPress. Entries (RSS) and Comments (RSS).